I'm not sure how to begin talking about Shadow Scale. I have waited so long for it. And the wait was worth it. I was so nervous about reading it, though, because I had heard there would be so little of Lucian Kiggs in this book. Which was true, sad face. But. I also loved this book to pieces. Because it was so interesting at all times and I was so excited about everything that was happening. I found the writing in this book to be stunning. All the characters were so very interesting to read about. I loved the world. There is so much to say about this book. I want to share it all. Because oh. Shadow Scale is all kinds of epic. There is so much happening at all times. And this book is long. Yet at times not long enough. I wish it had been even longer, though it is also perfect the way it is. But yes. So much is happening. I adored reading about Seraphina again. She is such an amazing character. So cute and adorable and so smart too. I just love her. Nothing of her dad in this book, though. Hmm. I'm curious about him, lol. But we do see a bit more of her Uncle Orma. And Eskar, his probably-lover. And I loved that. I adored reading about Orma and Eskar. Though something near the end made my heart shatter a bit. Ack. Yet so amazing and real at the same time. I loved how Orma still means so much to Seraphina. I loved how much Kiggs and Glisselda still means so much to Phina too. But sobs. The poor young Queen. Losing so much of her family in book one made me hurt so much for her. It's so sad and heartbreaking. Sniffs. Sigh. I'm not really sure how to talk about this book. But yes. Most of the plot of Shadow Scale is about Seraphina having to search for the other half-dragons. Those amazing characters she has had in her head for years. Which was so exciting to read more about. The garden in her head was kind of creepy yet so fascinating too. I loved reading about it. How she was connected to the different half-dragons. Oh, reading about them all made me so happy. And worried. And excited. It was amazing to read about. Most of this takes place with Seraphina on the road, and her being all over this amazing world. And I loved that. I loved it so much. Because it was all kinds of exciting and interesting and we got to learn so much about everything and I enjoyed it lots. I loved reading more about Seraphina and her struggles. And Abdo too! He is so young and so adorable and happy and I loved him to pieces. Though my heart broke for him a lot. Hmph. How mean. And omg, his family. His huge family. Loved reading about them. There is a new character in this book that we get to know a whole lot. Jannoula. And I just. Ahhh. What a villain. Sort of. Maybe. I can't even begin to describe my feelings for her. She was just so evil. She did so many awful things. But then we get to read more about her, and know her more, and I felt such sorrow for her, but then she did bad things. And I couldn't like her. I just couldn't. But yes. I felt sorry for her. But oh, how I loved reading about her. Such an amazing and interesting character to get to know. I love that there is a gorgeous map of the world in this book. It makes it easier to imagine places. Considering there is a whole lot of travel in this book, which takes days and weeks, so a map is all kinds of gorgeous to have :) And omg, the list of characters at the end of the book. And glossary. Okay, I didn't need any of them while reading, but amazing to look at after having finished the book. I loved it. And ack. 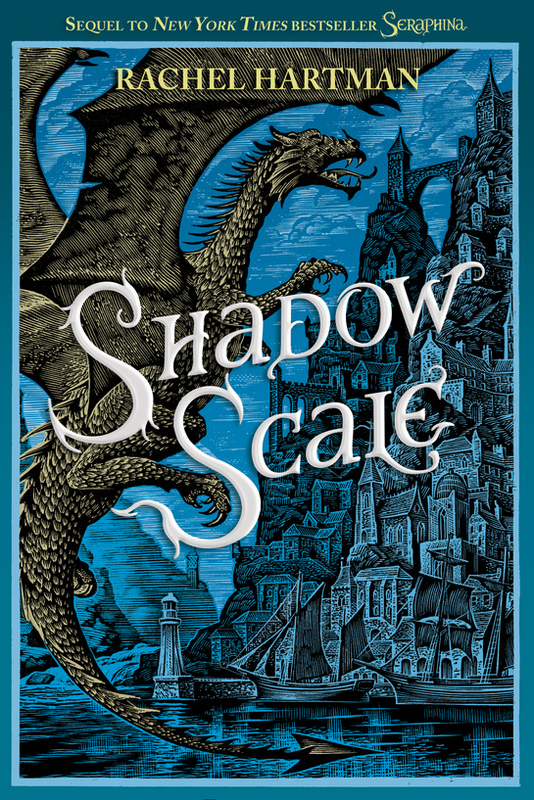 The cover for Shadow Scale. I cannot get over how pretty it is. It's just so breathtaking. There is just so much about this book. There is a lot of travel going on. We get to see so many amazing places. And people. So many people. Wishing I could name and talk about them all, but that would take forever :D But I will say that I loved reading about every place and every person. It was fun and interesting. And sigh. The dragons. I love the dragons in this book. And that Phina is a half-dragon is just amazing. It's written very well and I loved reading about them all. It's different and so amazing. I don't think I shall say too much more about this book. Just that it is full of awesome. And I loved reading every moment of it. Sure, I wanted a bit more romance, but there didn't need to be. And I loved that. I loved their friendships. It's stunning. I loved the characters so much. Sigh. Shadow Scale is an epic sequel. It is full of amazing adventures. There are many heartbreaking moments. Shadow Scale is just perfection. I loved every moment. It is a book worth reading. And everyone should be reading it. I feel like I should also talk a little bit about the romance in this book too. Seraphina and Lucian Kiggs. Whom is engaged to Glisselda, whom is like a sister to him. This relationship is complicated. And we do not get a lot of it in this book. But there are some small parts. And they are all amazing and so real. And I loved it to pieces. I won't say how things end, but I will share that I am so happy with how the romance ended. It was very honest to me. And I adored it. I just. I love Lucian Kiggs. Sigh. He's swoonworthy. This gorgeous book came out two days ago. And I'm really hoping you have all been out and bought it already. But if you haven't, you really should. Because this sequel is epic. It is amazing. And well worth reading. I read Shadow Scale from February 13th to 14th. <3 Took me forever, yet not long enough. I didn't want this book to end. And I would love for there to be a third book. I know, there doesn't need to be, but I really wish for one and would love to read one. <3 I really enjoyed and loved reading this book. As a child, RACHEL HARTMAN played cello, lip-synched Mozart operas with her sisters, and fostered the deep love of music that inspired much of her award-winning debut novel, Seraphina. Born in Kentucky, Rachel has lived in Philadelphia, Chicago, St. Louis, England, and Japan. She now lives with her family in Vancouver, Canada. To learn more, please visit RachelHartmanBooks.com and follow her below. It's open to US/Canada only. Books will be shipped from publisher. I'm really happy to hear you loved this one so much Carina! I'm still somewhere halfway with it, hopefully will get to finish it this week! I read and quite liked Seraphina, I have the arc for Shadow scale but I still have to read it! I haven't read Seraphina yet! Every time I look at it on my shelf, I mean to pick it up, but I always end up reading something else. I have to change that, though, because Shadow Scale looks gorgeous! I'm so glad you loved it, Carina!! Lovely post, Carina! I liked Seraphina okay, but didn't love it. I'm not sure if I'll be reading Shadow Scale, but I might give it a shot. I love Seraphina, and I've been dying for Shadow Scale to come out. Can't wait to read it! I love Seraphina, it was perfect in so many ways, and I've been dying for Shadow Scale to come out. Like reading every preview online to get snatches of it. I'm happy to hear that Seraphina and Kiggs end well... somehow. ;) Their romance has made me so nervous. Did you hear that she's writing another book, about Seraphina's human half-sister? I absolutely adored Seraphina, and I'm so, so psyched for the sequel. And judging by all the glowing reviews, it's going to be worth the wait. I'm on my second reading of Seraphina. It's one of my all-time favorite books. I can't wait to read Shadow Scale!